A visit to The Market wouldn’t be complete without a stop in our homestyle Restaurant. Here you’ll find everything from little nibbles to hot meals. 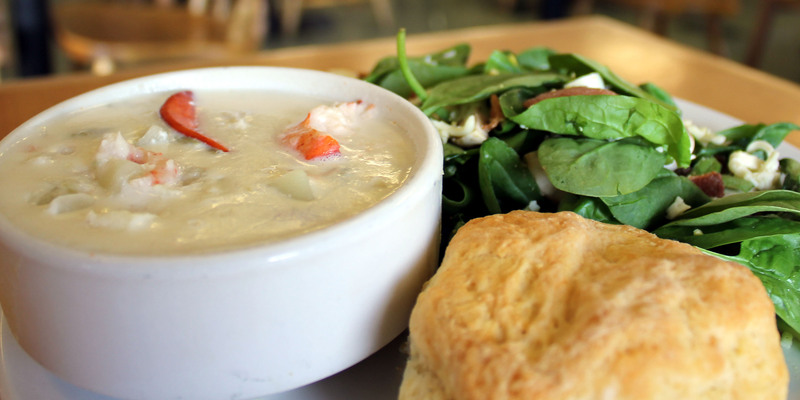 We’re famous for our “seafood full” chowder, filled with scallops, lobster, haddock, shrimp. Savour a bowl with a crusty roll fresh from our Bakery. Or line up your favorite homemade soup, beef chili, deli-style sandwich and fresh salad combo from our wide selection of made from scratch choices. Enjoy fruit cup, toast or bagel with a cup of freshly ground premium coffee for breakfast, or our huge breakfast sandwich on a Market made bagel bun. Choose from our selection of fine teas, muffins, scones, cinnamon rolls, donuts, or sweets. Check out our daily lunch specials for fresh ideas every day! 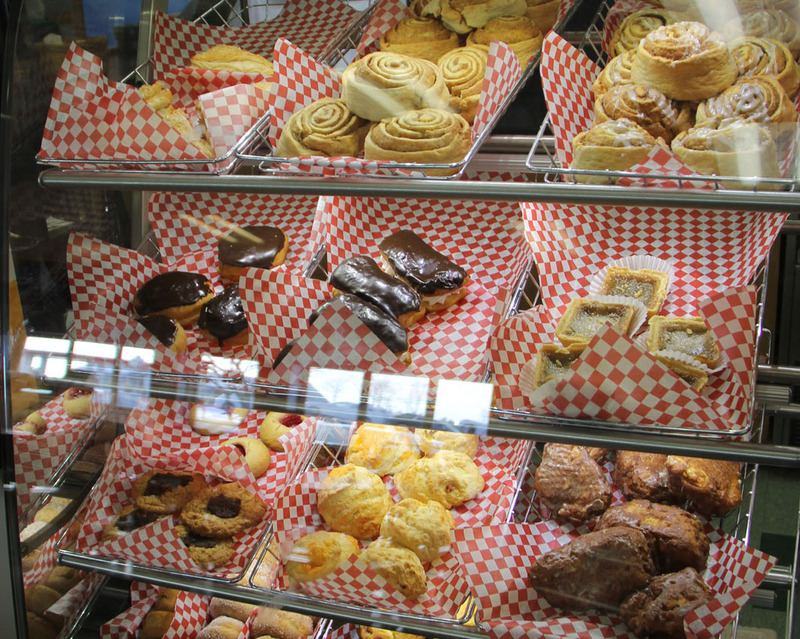 Enjoy something from our bakery case. Enjoy one of sandwiches on our freshly baked bread. Types of breads, fillings , condiments and toppings can be found below. Enjoy 1/2 of a sandwich of your choice and a side salad. Types of breads, fillings , condiments and toppings can be found below. Enjoy a cup of our homemade soup and a side salad. Soups change daily. Substitute Seafood Chowder for $2.00 more. Our full salads are made with the freshest ingredients and topped with a dressing of your choice. Salad choices change daily. Our side salads are a smaller versions of the full size fresh salads made with the freshest ingredients and topped with a dressing of your choice. Chock-full of a variety of seafood, fish and vegetables, this rich creamy soup is a long time Masstown Market favorite. Served with a Market-made roll or tea biscuit. Try a cup of our famous “seafood full” chowder with scallops, lobster, haddock, clams, shrimp, and cod. Served with a Market-made roll or tea biscuit. Shredded pork marinated in sweet and tangy BBQ sauce piled high on a Market-made bun. Enjoy a bowl of our Beef or Vegetarian chilli. Stick to your ribs goodness any time of the year! Traditional tomato based recipe, loaded with beans and veggies and not too spicy! Enjoy a cup of our tasty Chilli. Stick to your ribs goodness any time of the year! Traditional tomato based recipe, loaded with beans and veggies and not too spicy! Masstown Market’s award-winning recipe packs a flaky pastry with haddock, cod, shrimp and scallops along with garden vegetables, cheese and delicate spices to enhance the flavour. Enjoy a bowl of our soup made right in the Market. Enjoy a cup of our soup made right in the Market. Choose from: White, Whole Wheat, 5 Grain, Rye, Flat Bread, Whole Wheat Wrap, Kaiser Roll or a gluten free bread (for extra charge). Choose from: Turkey, Ham, Roast Beef, Smoked Meat, Chicken Salad, Egg Salad and Vegetable. Choose from: Lettuce, Spinach, Tomato, Red Onion, Cucumber, Peppers, Pickles, Sauerkraut, Black Olives and Cheese. Choose from: Mayo, Honey Mustard, Ranch Dressing, Mustard and BBQ Sauce.